Looking for your next amazing adventure? How does 6000 miles of pristine coastline with some of the most idyllic beaches in the world sound? Maybe you want to explore ancient ruins and experience a unique culture? Or if you’re anything like me, amazing food and cheap drinks will be high up your wish list? Then look no further than Mexico! Say hello to tacos, tequila and fresh coconuts on the beach. Talk about paradise! In a country as big as Mexico, it’s easy to feel a little lost when planning your must sees and dos. This huge nation is home to epic landscapes; from the jungle to the deserts, snowy peaks to white sandy beaches, Mexico has it all. I’m here to help you choose, with my list of the top things to do to in Mexico. Cancun is a top destination for anyone looking for some fun in the Mexican sun. Located in the Yucatán peninsula, Cancun is well known for its stunning beaches and ridiculous weather. Its nightlife and endless activities make it an irresistible location for families and spring breakers alike. Although it would be easy to spend your entire holiday lounging around and sipping on margaritas (we wouldn’t judge), there are so many things to do in Cancun. If you’re feeling adventurous, there are loads of exciting water activities to choose from – sailing, jet skiing, diving or snorkelling around the Mesoamerican reef to name just a few. Swimming in Cancun’s natural sinkholes (AKA cenotes) is also an unforgettable experience. If you prefer to keep your feet planted on firm ground, visit the nearby ancient Mayan ruins known as El Ray – not to be missed! Be sure to also check out Coco Bongo, the city’s most famous nightclub. Every night there’s live dancers, music and DJs, not to mention cheap drinks and a party that doesn’t stop until the sun comes up. Tulum is a town on the Caribbean coast, an hour and a half south of Cancun. It’s home to pristine white sand beaches and well-preserved Mayan ruins that date back a thousand years. Tulum has seen an increase in backpackers in recent years thanks to its reputation as an eco-friendly hippy town with zen vibes. Many of the shops along the beachfront feature yoga studios, boutiques, healthy cafés and restaurants covered in lush plants. Tulum is ideally located near some of the country’s most impressive cenotes, as well as the awesome Tulum National Park. From the town itself there are plenty of options for day trips and further adventures. For a super laid-back evening, hit up Todos Santos for an extensive cocktail and mezcal menu. You’ll be spoilt by amazing local DJs in this trendy bar that’s popular with natives and backpackers alike. Playa del Carmen is a coastal resort town on the world-renowned Riviera Maya. The beaches here are some of the most beautiful in Mexico – but would you expect any less from the Caribbean coast? Tall, leafy palm trees line the white sand beaches, creating a picture-perfect beach escape. In this gorgeous, relaxed atmosphere, your only concern is watching out for falling coconuts while lounging on the beach! Don’t miss out on snorkelling along the colourful coral reef that runs along the shoreline. You may even be lucky enough to catch a glimpse of a sea turtle! Take time to explore Rio Secreto, also known as the secret river, where crystal blue waters run through an underground river system. The daredevils among you can swim and climb between caves and through various tunnels. The water is so clear that you can see all the way to the bottom of the cave, which has been known to cause vertigo! For an unforgettable stay in Playa del Carmen check out The Yak hostel to meet amazing people from all over the world, sway in hammocks and sunbathe on the rooftop terrace. But don’t just take my word for it, more than 2000 guests have reviewed this hostel and the results are superb! Chichen Itza was once one of the largest Mayan cities in Mexico, believed to have been in full economic bloom in 600 AD. Travellers from all over the world flock to the impressive ruins of this UNESCO listed site. Located in the state of Yucatan, Chichen Itza can easily be visited on a day trip from any of the nearby costal towns. An enormous pyramid called El Castillo dominates the landscape of the ruins, and is surrounded by many smaller pyramids and structures. Take time to explore and get a little lost in the ruins of this amazing ancient city and let yourself be transported back in time. For that perfect shot be sure to arrive as early as possible, as from 10:30am the tour buses begin to roll in by the dozen! It gets extremely hot in and around Chichen Itza towards the middle of the day, so make sure you pack plenty of sunscreen, water and a hat! Puerto Vallarta is a city on the Pacific coast, famous for its beachy resorts and nightlife. Backpackers head here to explore the historic centre of town known as El Centro, where cobblestone streets lead to quaint shops, boutiques and local restaurants. You won’t be satisfied with just one visit to this area! It’s recommended to visit at sunset, as the colours of the sky on the ocean create the most incredible backdrop. For an amazing view overlooking Puerto Vallarta old town and the stunning coastline, climb to the top of Mirador Cerro de La Cruz. Although this requires a little bit of effort underneath that harsh Mexican sun, I can assure you the views are 100% worth it! Mexico City is a top choice for travellers who crave hustle and bustle. Surrounded by the Sierra Madre mountain range, this city leaves a lasting impression on all who visit. Most of the main attractions are located in the historic city centre, a buzzing fusion of cultures where Aztec history combines with Spanish influence. Also known as the Centro Historico, this area can easily be explored on foot. This way you’re sure to run into some hidden gems along the way, like markets, boutiques, amazing restaurants and of course live music! Octopus tostada: this seafood is some of the freshest in the world and will send your tastebuds into overdrive. Chilaquiles: a yellow corn tortilla chip with chicken, bread, cheese and sour cream deliciousness… need I say more? Torta: a Mexican street sandwich that usually comes with pork, salsa and lots of guac. Tacos: you haven’t tasted tacos until you’ve had street tacos in Mexico City. Churros: those with a sweet tooth MUST sample the churros! Mexican doughnuts covered in cinnamon sugar. Merida is the capital of the state of Yucatan. Beautiful, vibrant and rich in history, Merida is a quieter destination that’s overlooked by many travellers heading for the beach. Walk through the main square to start exploring and admire all of its brightly painted buildings. Merida is one of the safest cities in Mexico and offers a break from the crowded traveller hotspots. An hour southwest of Merida are the Uxmal ruins – less visited than Chichen Itza, but according to locals much more impressive! Cabo San Lucas and San José del Cabo are two towns in the Los Cabos municipality. Situated on the tip of Baha California, these iconic beach towns are linked by a long corridor lined with beachfront resorts. Completely unique to the rest of Mexico, Los Cabos boasts a desert landscape that stretches out for miles before disappearing into white sand beaches, and impressive formations of stone archways can be seen on the shorelines. Los Cabos has a reputation as a wild party destination, with many bars and restaurants offering top-notch nightlife. It won’t disappoint those looking to party like rock stars – especially when you can nurse your hangover on one of those postcard-perfect beaches. Looking for a way to escape the heat and still keep partying? Make a splash at Nikki Beach Club, that boasts one of the best pool parties in Los Cabos and is never in short supply of tequila, banging tunes and good vibes. Oaxaca is a cultural, vibrant city in central Mexico. Famous for being a culinary destination, Oaxaca promises its visitors a unique and memorable foodie experience. You won’t have to wander long through the colourful cobblestone streets to find a festival or open-air market that’s overflowing with stalls cooking authentic, aromatic dishes. Oaxaca also stands out for its rich indigenous culture. Museums, art galleries and artisan markets feature traditional artefacts and crafts. Many murals have been painted on the facades of buildings to depict history and tradition. Did you know that some of the best mescal in Mexico is made in Oaxaca? This smoky alcoholic beverage makes for a great souvenir for friends and family back home, or just a great night out on the town. Isla Cozumel is Mexico’s largest Caribbean island, reached in 45 minutes by ferry from the mainland. Still notably undeveloped in comparison to its neighbours Playa Del Carmen and Cancun, Cozumel is the perfect destination for travellers looking for a peaceful, rustic stay. The island offers wonderful snorkelling and diving opportunities along the Mesoamerican Reef. There’s also an ecological park called Punta Sur that offers visitors untouched beaches, along with the chance to see local wildlife. Sea turtles, exotic birds and crocodiles are among the animals you’re likely to meet! A great place to stay on Isla Cozumel is Amigos Hostel Cozumel. It’s a fantastic spot to chill out after a few nights of partying in Cancun, relax by the pool, meet friendly travellers and read in the tropical fruit garden. So there you have my top 10 things to do in Mexico! How many have you ticked off your bucket list? My name is Louis Cuthbert and I have been travelling the globe for the last two and a half years with my fiancé documenting our adventures. Follow our journey on Instagram @one_globe_travels. 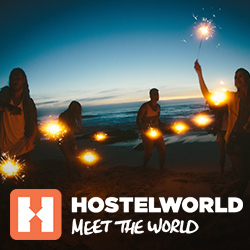 The post Top 10 things to do in Mexico appeared first on Hostelworld Blog.